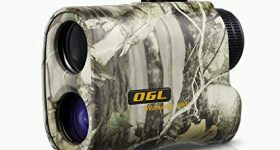 If you intend to get a laser rangefinder, the OGL Wild Hunting is an option to consider, due to the attractive specs, overall performance, and good standing with customers in general. What you need in your laser rangefinder most and foremost is the ability to establish and provide proper measurements for the distance between you and your target. This can dramatically increase your success rate, and that is why this model comes highly recommended. Besides doing its job at the highest parameters and standards, the OGL Wild Hunting offers other benefits, as well, and we will talk about all of them right away. The first things you will learn about this model will come from the specs offered by the manufacturer. This model has a magnification of 6x and can provide measurements for distances between 5 yards and 540 yards. Capable of working in weather conditions that go from cold to hot, it is a pretty good investment. Whether you want to hunt in below-freezing temperatures or scorching hot conditions, this model will behave well. There is a scan mode included, and the battery type required is CR2/3V. The model has a low power indicator that will let you know when you need to recharge it. What you need your rangefinder to be able to do is to measure the distances between you and your prey in a correct manner. This model from ogl offers reliable performance, as it is capable of taking measurements fast with just one-yard accuracy error in both directions. Also, you will get a range of 540 yards that the unit will scan using its advanced speed technology. All in all, this model is a high-performance rangefinder that will deliver as needed, in all weather conditions. Seeing how rangefinders have an optical component that matters, it is a good idea to talk about the lens quality next. In this case, the Ailink Wild Hunting comes along with an ultra-clear lens that will allow you to see everything in the range distance mentioned earlier. The fact that the optics are multilayered also helps with the overall image quality, and you will like that the lens display has some useful information provided directly in front of your eyes. You will not only read the distance, but you will also be able to see the battery meter. Any hunter wants to know that his or her equipment will be able to provide some resistance to wear and tear, as well as inclement weather. 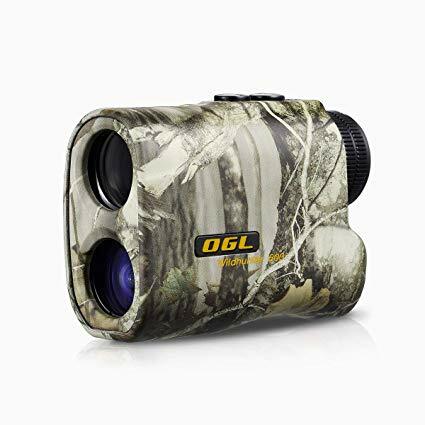 That being the case, you will be pleased with the fact that this laser rangefinder comes with a durable body that is resistant to both water and dust. Seeing how it is also designed to resist freezing temperatures as well as those that go well into dangerous heat levels, it is safe to say that this is a pretty strong pick for even the most demanding hunter. Seeing how this model weighs less than half a pound, you will find it very comfortable to carry around. It is also compact so that you can easily find a place for it in your backpack. Many hunters also want to know if the rangefinder they pick comes with some extras, as they can save some money in this manner. For this particular model, the manufacturer includes a case and a lanyard, which means that you can carry it around without a problem. The strap lets you wrap it around your wrist so that you don’t risk losing it, and the cleaning cloth made from microfiber will keep the lens crystal clear. A quick start guide is included with your purchase, as well as a 2-year guarantee. This excellent rangefinder makes a superior ally when you are out in the field, hunting. It is also suitable for passionate golfers, and, practically, any activity that requires range measurements will benefit from the use of this reliable model. As it is lightweight and easy to carry around, it is a smart addition to the gear you already carry with you, and even a carrying pouch and a strap are included, for maximum convenience. You will appreciate, of course, the fact that the unit can scan your surroundings fast to give you accurate measurements for the distances between you and your targets.